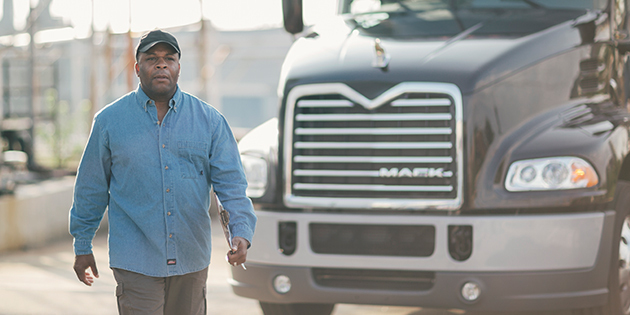 You’ve always trusted Mack® Engine Oil to provide the very best protection for your Mack truck. But, as you may have heard, our formula recently changed. However, there’s no need to be alarmed. Because our new formula isn’t just different – it’s better. Much better. Here’s why. In December 2016, the heavy-duty trucking industry began using a new classification of oil called CK-4, which is designed to meet 2017 model year emissions standards. These new emissions levels require engines to run at higher operating temperatures than ever before, which means the engine oil you use had to be reworked so that it could withstand these hotter underhood environments. At Mack Trucks, that meant creating new Mack Engine Oil EOS-4.5, which not just meets but exceeds the CK-4 spec. Here are some of the benefits of our new formulation. That means your fleet can drive further on fewer oil changes. In fact, with new Mack Engine Oil EOS-4.5, you can skip between four and 16 oil drains over the life of your vehicle, depending on duty cycle. But that’s not all. New Mack Engine Oil EOS-4.5 is so advanced that, for the first time ever, our oil drain interval recommendations actually exceed our engine drain interval recommendations by 5,000 miles. New Mack Engine Oil EOS-4.5 delivers enhanced performance for oil oxidation and oil aeration control, as well as improved shear stability. This means the oil won’t break down at high operating temperatures or under severe stress, so your engine’s critical internal components are better protected from premature wear. While new Mack Engine Oil EOS-4.5 was specially designed for Mack MP7, MP8 and MP 10 engines, it can be used in any make or model, including older, previous emissions-level engines. Be sure to ask your local dealer about new Mack Engine Oil EOS-4.5 during your next PM check. And don’t forget – it’s also available now through the SELECT Part Store™. Enroll today for real-time stock status and pricing information from your local dealer, 24/7 online ordering, fast delivery and exclusive discounts.